It’s that time again for one of Lakewood’s cherished community events, the Intergenerational Tea Party. Launch your dreams of space exploration in a fun-filled afternoon at the Woman’s Pavilion, Lakewood Park. The party is scheduled for Wednesday, March 27, 2019 from 4 to 6 P.M. Our guest of honor is Luciana Vega, the 2018 American Girl Doll, Girl of the Year. This year’s theme is Space Exploration and we are ready for a STEM afternoon. The Woman's Pavilion will be transformed into a space camp, complete with a presentation by Great Lakes Science Center on STEM. The party will start with delicious tea-time sandwiches, tea, hot chocolate, goodies, and of course, our perennial favorite, the Parade of Dolls. Dress for a space exploration party, and bring your doll or teddy bear to join in the parade, as it winds its way through the room. Moms don’t forget your cameras! There will be tickets for sale for the raffle prizes. The highlight of the afternoon will be the drawing for our guest of honor, American Girl Doll, Luciana Vega. Tickets are $15 each, which includes your chance to win Luciana Vega. Purchase your tickets and reserve your place now. Seating is limited, so act quickly! Judge Denise Nancy Rini is on a mission to tell you about Juvenile Court. Since taking the bench, Judge Rini has worked to improve the efficiency and spotlight some of the challenges facing our youth. “I believe that Juvenile Court touches everyone in Cuyahoga County, whether it is the neighbor who mows your lawn, the teenager driving down your street, or the youth who bags your groceries. Everyone is affected by the commitment of Juvenile Court,” states Judge Rini. Ever wonder what life on the Gold Coast was like a hundred years ago? Was crime a part of the scene? Are there any haunted buildings or spooky places on the Gold Coast? On October 27, the Lakewood Historical Society will host a walking tour, and will share information of the Edgewater Drive/Lake Avenue/ Cove Avenue neighborhood from around 1918. The high rise apartment and condominium buildings have replaced mansions that had large lawns, beautiful gardens and long driveways. What brought about that change? Who were the families that resided on what was referred to as the “millionaires row” of the west side? Those questions will be answered, and, in keeping with the season, a few little known and mysterious facts will be shared, with reports of a murder or two thrown in for good measure. Lakewood High Class of 1971, 65th Birthday Clambake Dates!!! We will meet at Vosh in Lakewood at the corner of Riverside and Detroit on Friday, September 28th, 6:00 pm to ????. This is a rendezvous for drinks, light food, and friendship. Here's One Festival You Don't Want To Miss! With the commencement of Session Wednesday, June 27th, summer recess for the Ohio Legislature officially began Monday, July 2nd. The last Session before summer saw a flurry of bills voted on the House Floor, both good and bad legislation. This week marks the 44th Annual National Emergency Medical Service Week, a week dedicated to honoring the brave citizens who devote themselves to providing life-saving care to Americans. Putting themselves in harm’s way, EMS providers respond to everything from active shooter situations to drownings, from behavioral health crises to vehicle collisions. Truly, emergency medical technicians and paramedics are public servants in every sense, ensuring we all have access to critically important care when we need it. The Tuesday, May 8th Primary Election may have only seen 23.4% voter turnout county wide, but here in Lakewood the contests were as contentious as ever. Locally, the two hottest races were the Democratic Primaries for two seats in the Ohio legislature, i.e., the State Representive seat for District 13 (Tom Bullock vs. Michael Skindell) and the State Senate seat for District 23 (Nickie Antonio vs. Martin Sweeney). Three of the four candidates, all but Sweeney, are Lakewood residents, which certainly contributed to the intensity of these particular races. In addition, it should be noted that Skindell currently holds the District 23 State Senate seat and Antonio holds the District 13 State Representative seat. We had a trifecta of success this week as two pieces of my legislation, House Resolution (HR) 193 and House Bill (HB) 464, and a floor amendment on school safety, made inroads through the legislative process. Lakewood Charitable Assistance Corporation is once again in need of lots of helping hands. On Saturday, May 12th beginning at 9:00am, LCAC will sort and deliver bags, jam packed with cleaning supplies, to 250 family households and senior residents in need. The last time I wrote about my oldest daughter Madelyn Liston ("Mattie") in these pages, she was 18 years old and had just signed a National Letter of Intent to accept an athletic scholarship at Ohio University. That was over eight years ago. She subsequently spent four years as the net-minder for the OU’s Women’s Soccer squad, then graduated and began her career. Celebrate Spring With Earth Day, The Great American Cleanup, And Keep Lakewood Beautiful! Spring sunshine and warmer winds have finally arrived here in Lakewood, Ohio. The Keep Lakewood Beautiful organization is celebrating this time of year with its Annual Earth Day and Great American Cleanup on April 28th from 9am-1pm beginning at Lakewood Park. Come one or come all and help spruce up public areas in our city. Learn about recycling, learn from an arborist, and you can help:plant trees in observance of Arbor Day, plant flowers, mulch trees, or pick up litter. Meet at the Women’s Pavilion at Lakewood Park. Lunch will be provided after volunteering. For more information or optional pre-registration requested, please see:http://www.onelakewood.com/KLB or call 529-6601. Most of us have insurance and can pay for medical care. However, there are many residents in our community that don’t have this privilege. We don’t tend to think about those without health insurance who cannot afford the medical care they need. That’s where places like North Coast Health come in. North Coast Health (NCH), located on Detroit Rd in Lakewood, is a charitable medical clinic. Anybody 14 years or older is welcome to schedule an appointment. The majority of patients are low income which makes it possible for them to receive care for free or at very low cost. North Coast Health also helps patients apply for Medicaid. When a patient arrives, they are greeted by the front desk where they get checked in for the appointment. The staff also helps connect patients with specialty services at the Cleveland Clinic and MetroHealth, they provide Giant Eagle gift cards for food, and bus passes. A medical assistant takes the patient to the exam room and checks blood pressure and reviews medications. The doctor comes in next and provides a physical exam, explains what’s going on and the best treatment. Patients who have chronic conditions can meet with the nurse for education. Anyone who needs medications can see the pharmacy technician for assistance. There is also a counselor to help with behavioral health needs. I am encouraged by the developments of House Bill 302 (HB 302), a piece of legislation I introduced with Representative Kristin Boggs (D-Columbus). The bill would allow pregnant minors to consent to prenatal through delivery and follow-up health care in order to have the best health outcomes for the mother and her unborn child. On February 24, 2018 Lakewood New Life Church (LNLC) will be hosting a coffee night event to officially launch their new young adult ministry called HEARTBEAT. It is going to be a fun night of food, games, live music, and of course lots of coffee. This event will take place from the hours of 6 – 9 p.m. at 14224 Detroit Avenue in Lakewood. Each year we have some fun with Post of the Year, but this year one member, an Ex-Assistant Attorney General of the State of Ohio, and an ex-Department of Justice attorney, who brought an entire series, was selected and singled out. To be honest it is something every Lakewoodite needs to read. It has little to do with the hospital, outside of City Hall’s actions. Mark Kindt underlines what norms people should expect from their Government, based on decades of experience. Vivek Khosla, Principal Consultant at KBACE, A Cognizant Company, won first place in the Toastmasters District 10 Humorous Speech Contest. The event was held on Saturday, November 4, 2017, at the Crowne Plaza in Independence, Ohio. With the help and support of Councilwoman City Marx, the Observer Media Project has joined the Maltz Museum of Jewish Heritage in their “Stop the Hate” essay contest. The $100,000 ESSAY CONTEST is for Northeast Ohio 6-12th Graders. You have the power to make a positive difference in the world. Each year, the Maltz Museum of Jewish Heritage gives out $100,000 in scholarships, awards and anti-bias education in recognition of 6-12th grade upstanders in Ashtabula, Cuyahoga, Geauga, Lake, Lorain, Mahoning, Medina, Portage, Stark, Summit, Trumbull and Wayne counties. This week, I was disappointed by the delay of a second hearing on House Bill (HB) 160, which is being rescheduled for an unspecified date in January. HB 160, titled "the Ohio Fairness Act", would bar discrimination based on sexual orientation and gender identity in areas of employment, housing and public accommodations in Ohio. Thanks to hundreds of volunteers of all ages, Lakewood Charitable Assistance Corporation’s Thanksgiving food basket distribution was an incredible success! Turkeys and all the fixings needed to prepare a family feast were delivered to 300 Lakewood neighbors in need. According to LCAC President, Ellen Todia, this was the first time in 28 years that distribution day packing was held indoors and, with the help of an army of dedicated volunteers, it went off like clockwork. Beginning this 2017-2018 school year, high school students in Ohio and our community will learn about organ donation in their health curriculum. 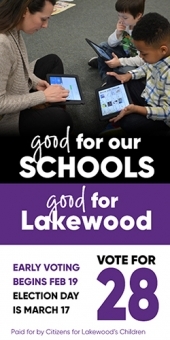 “There is no place for hate in Lakewood. Last night, someone vandalized a driveway on Belle Avenue by painting two swastikas on it. I made the decision not to post the photos online as I believe it gives the symbols too much attention." “Our attention needs to be on how sad and sickening this hate crime is. I visited the family this morning and offered my Columbus office's full assistance. Moreover, Lakewood police are investigating, and Tony Gelsamino from the Health and Human Services Department in Lakewood arrived to offer city assistance. Many neighbors have offered their help and kind words. We will pull together and we will not let hate divide us. This act of hate will only serve as a catalyst to unite us within the community." This week, State Representatives Nickie J. Antonio and Kristin Boggs announced new legislation to help ensure that young pregnant women in Ohio have a say in their own healthcare decisions. Yesterday in Columbus, State Representative Nickie J. Antonio and Janine Boyd introduced legislation to better protect victims of domestic violence from their abuser by requiring those convicted of a domestic violence crime or served a civil protection order (CPO) to temporarily turn over their firearms to law enforcement. According to Center for American Progress, the most dangerous time period for victims in abusive relationships is immediately after they file a civil protection order. Additionally, the risk of homicide at the hands of an intimate partner increases eight times when a gun is in the home. Help your pets enjoy this beautiful time of year without having to suffer from environmental dangers. Summer is a great time to see the vet for parasite prevention and testing, vaccinations and allergy medication. Little Free Libraries have spread to at least nine locations in Lakewood, and tens of thousands more, worldwide. It seems that awareness of these micro-libraries is still catching up, though. When a friend of Dr. John Mumma mentioned seeing him outside by his postbox one day, while passing Mumma’s home on Hilliard, the doctor immediately recognized the error. “I said ‘that’s not a postbox,’” he recalls as an example of the ongoing task of explaining a Little Free Library. “Some people are incredulous” at the concept, he adds. The concept of the Little Free Library (LFL) is ultimately simple: a small public shelter, where people borrow or donate books, for free. Yet it’s a surprisingly recent idea. Todd Bol built the original Little Free Library in Wisconsin just eight years ago. Noelle Champagne and her husband installed the first in Lakewood, outside their home on Parkway, a few years later. But a majority of the local LFLs have arrived within the past 18 months. Little Free Libraries can be easy to overlook, perhaps especially in Lakewood. The Kenny family installed theirs on Elbur more than three years ago, but like most LFLs it’s a modest wood structure with a shingled roof. In a city like ours, with substantial variety among the housing stock, the typical Little Free Library blends in well even without trying. Many of the local Little Free Libraries appear to be popular with children. Garfield Middle School has one of its own, and Garfield students also take great interest in Tony Neuhoff’s library, south of the school on Grace. Dr. Mumma says that students at Harding are a significant audience for his library. The libraries have plenty of adult fans, also. Champagne says that over the years a number of people have driven specifically to check out her Parkway library, one of two in Lakewood listed at littlefreelibrary.org. North Coast Health set up the other one, outside of its offices on Detroit, in hopes of stimulating curiosity about them and the services they provide. “It has actually done that” very effectively, says Mary Ludwig. Most of Lakewood’s Little Free Libraries, though, are unlisted and operated solely as hobbies. Nearly all have some sort of family connection; someone may have been first exposed to a Little Free Library through a relative who owns or lives near one, and nearly every LFL in Lakewood was built by or with a close family member. The library on Lincoln appears to summarize most of the movement’s themes of family, volunteerism and person-to-person networks. The owner’s daughter in Maryland owns a Little Free Library too, and her son lives on the same street as one in Lakewood. She says that he “was good enough to surprise me with one” of her own last Christmas, which he built himself. While the Fourth of July is one of the best times of year to be a resident of Lakewood, the holiday can be a nightmare for pets. Did you know that July 5th is the busiest day for animal shelters across the country? The stress and anxiety that fireworks cause in animals can lead to pets running away from home and finding themselves scared, exhausted and in dangerous situations. Your pet can panic and jump a fence or break away from a leash because of fireworks. Never leave your pet outside during fireworks and never take them with you to a fireworks display. If you believe they will experience anxiety when they hear the fireworks show, have someone stay with them during that time. Should the worst happen, and your pet runs away, make sure that their microchip is active and they have a collar with up-to-date tags that will make it easier to be reunited. Safety collars will release if your pet gets stuck on something unsafe. A little planning in advance can minimize the risks the holiday can bring. Prevention is vital in keeping our pets safe and healthy. The warmer months can be uncomfortable and sometimes hazardous for pets, but there are many easy ways to prepare for, and avoid, the dangers of summer. 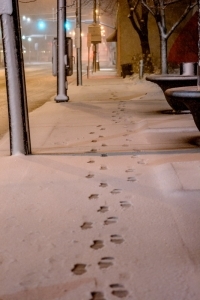 Coyotes are cautious animals that are common throughout Cuyahoga County and all of Ohio. Coyotes have coexisted amongst us in Lakewood for years, rarely being noticed. Today, there are at least three alpha pairs, and their groups, living in Lakewood. An alpha pair lives in the Madison Park vicinity, another pair lives in the South West Corner, and the third pair in the Lakewood Park vicinity (see map.) Coyotes are located in dense urban populations all across the United States including Chicago, Los Angeles and even New York City. Beer Engine Fundraiser For The LCAC Both Successful And Fun! On behalf of Lakewood Charitable Assistance Corporation (LCAC), I am honored to thank the Beer Engine, their wonderful staff and the hundreds of supporters of the LCAC here in Lakewood who worked together to raise $8,580 during the Beer Engine’s 10th anniversary charity fundraiser for the LCAC that was held from March 13th through March 19th. Beer Engine’s 10th Anniversary Is A Win, Win, Win! The Paszkowskis are very grateful to the residents of Lakewood for all of their support during their first year. “We’ve expanded our merchandise,” said Dennis. The refrigerated section at Urban Bulk Foods now includes meats and cheeses from Walnut Creek Foods, Troyer and Dutch Valley in addition to the cage-free eggs and the popular Amish rolled butter. For the vegan, Urban Bulk Foods now offers Butler Soy Curls, a tasty meat alternative that is sold only in five Ohio stores. 2016 was a banner year for public health researcher Dr. Mary Beth Zeni, RN, ScD, associate professor at Ursuline College in Pepper Pike. While sitting with friends enjoying dinner at Toast in Gordon Square, Nancy Osgood got a big idea that would promote women’s rights and women’s safety in an “in your face” way. LCAC Does It Again At Thanksgiving! Food Items & Volunteers Needed For Christmas Food Drive! Despite the weather and a malfunctioning truck lift, Lakewood Charitable Assistance Corporation’s (LCAC) Thanksgiving Food Basket Distribution was an amazing success! In the face of plummeting temperatures and freezing rain, a record number of volunteers showed up to help the LCAC to sort and bag non-perishable food items as well as deliver turkeys, potatoes, pies and all the fixings to 300 of our Lakewood neighbors in need so that they could enjoy a full Thanksgiving meal with their families. Like many Lakewood kids, Meghan Walcheck spends a lot of time and energy on her favorite sport. She spends many hours each week practicing, being coached, and competing. She’s even traveled out of town to competitions. Meghan doesn’t run track or play any of the traditional “stick and ball” sports – she is an Irish dancer. Keep Lakewood Beautiful, a community group that supports the Adopt-A-Spot Program, Earth Day and the Spring Humus Sale, also sponsors an annual Beautiful Home Award process. The pictures accompanying this article are the 2015 Beautiful Home winners - beautiful, right? The 2016 “Come Home to Lakewood” House and Garden Tour, presented by The Lakewood Historical Society is scheduled for Sunday, September 11th, from 1 to 6 p.m. This bi-annual tour invites you to explore some of the finest examples of Lakewood's diverse architectural styles, including a classic lakefront English Tudor, a stately brick Arts & Crafts, a two-family dwelling rich in character, a four square with hipped roof and full front porch, a home that brings together Prairie and Craftsman design plus a garden tour filled with lush perennials. Also included on the tour are one of Lakewood’s few remaining carriage houses, still serving a waterfront mansion and a fully-restored turreted Queen Anne Victorian, which was featured on the 2014 Home Tour as a renovation in progress. The C-SPAN Bus arrived in town last Friday for a day-long educational opportunity at Lakewood Park. The bus, an interactive multimedia learning center, offered numerous lessons in US Presidential elections and history. Lakewood was its second stop in the Cleveland area, where it will spend the week during the RNC Convention. If you think kids aren’t into cleaning, think again! This year, students at Garfield Middle School and Emerson Elementary School have joined forces to support Lakewood Charitable Assistance Corporation’s Spring Cleaning Drive. An elderly Euclid man whose house was repeatedly egged by an unknown assailant for more than a year, will have his house repainted free of charge this summer by Neubert Painting. The house on Wilmore Avenue, which received national attention for the incident, was egged more than 100 times between May 20, 2014 and June 26, 2015, according to reports. Ohio was in the national spotlight on March 15, as voters went to the polls in the presidential primaries. Campaign offices of many types sprung up around the state to get out the vote for the big day. After the votes were counted, professional campaign operatives scattered to future primary states, and most of the campaign offices went back to being vacant storefronts. However, one exception remained in Lakewood. Hillary Clinton won the Ohio Democratic primary, and widened her delegate lead over Bernie Sanders with other big wins in states like Florida. Most national pundits believe Sanders has virtually no chance to catch up to her. Despite this, the volunteers at the Lakewood Sanders office decided to fight on. They are keeping their office open and using it as a hub for phone banking to future primary and caucus states. They are also organizing trips to Pennsylvania and New York to register voters and canvass before those states' primaries. "I don't think it's over," said Lakewood resident Eric Deamer, an avid Bernie volunteer. Deamer pointed out that after the Ohio vote, about half of the states had yet to vote. In addition, many of the remaining states are considered to be more favorable to Sanders. Deamer is pleased that the office is still busy, "It's a hub of activity, and a physical presence." Reviewing The Best Picture Nominees: What's Your Favorite? The 88th Academy Awards are approaching, and for those of us who love movies it is an opportunity to think about what makes a film compelling and sometimes unforgettable. Here are brief reviews of the eight nominees for Best Picture, ranked in order of this reviewer's favorites. After Lucky, photographer Bob Soltys' Jack Russell Terrier and man about town over the last ten years, suffered a near-death experience in the Rocky Mountains last summer, he decided to tell his life story and self-publish it with some help from his Dad. December 29th marks the end of an era as the Thrifty Peddler - Lakewood Hospital’s resale shop - closes its doors. As age catches up with the volunteers who run the operation, and circumstances change, it is time to say goodbye to the Thrifty Peddler, an effort that has served its purpose to support special projects and services at Lakewood Hospital well beyond its original intent.